Kia will be showing a concept car at CES that they dub the KND-7. 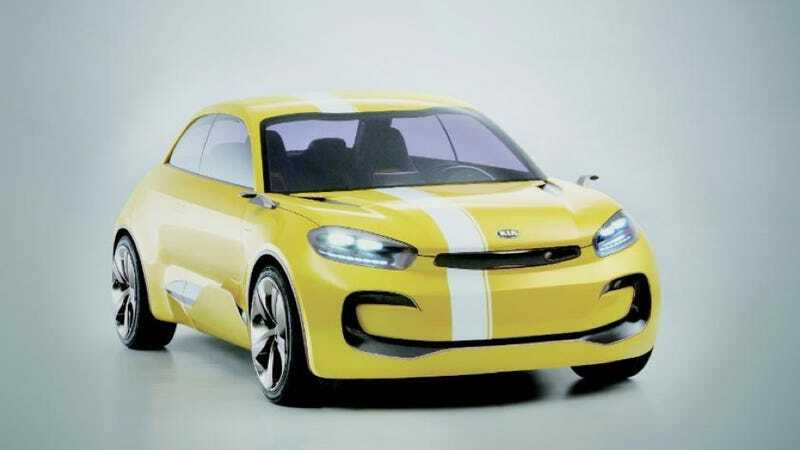 And it looks exactly the Kia CUB Concept from the Seoul Auto Show. Except this time it has its lights on. Details are scarce on the KND-7, but if it's anything like the CUB, then we can assume quite a few things. It's yellow. It has all LED lighting. It has cameras for mirrors and turning veins for turning. The steering wheel will monitor bio rhythms. And it'll have a 204 horsepower, 195 pound foot turbo engine connected to a six speed manual. In fact, based on appearances alone, the only difference is that the lights have now been turned on, probably to increase seeing abilities.